We love referrals! Because we have such happy parents/students, we get a lot of new students through referrals. Getting your friends involved with the program lets them share in similar interests and makes it all that more fun. Or maybe you have friends with children that love music and may want to start learning an instrument? Either way, as a way of saying thanks, we will give both you and the referred family, each$32 (equivalent to a FREE 30-min lesson!). There is no limit to the amount of referrals you can make. Music lesson is more fun with friends, and it’s very simple to refer your best pals and get a small reward — for you and your friends. 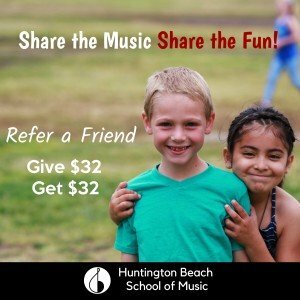 The next time you come to Huntington Beach School of Music, bring a friend. This way they can experience the benefits of music lesson with you. If your friend signs up, you get $32 toward next month and your friend gets $32 off their first month. When your friend signs up, just specify your name in the registration form online at http://www.hbschoolofmusic.com/registration so that we know whom to send our thanks and the reward. If you have a lot of friends, you can ask our front-desk admin for some Refer-A-Friend cards that you can pass out to your friends. You can earn more than one referral if multiple friends sign up too! It’s super simple to share on Facebook. Just click the links below to refer your friends. Previous Previous post: How to Choose the Correct Violin Size?